Objective: To evaluate the efficacy and tolerability of levetiracetam (LEV) add-on therapy in children with refractory epilepsy. Materials and Methods: We evaluated 102 children (56 boys, 46 girls, mean age 96.00 ± 31.15 months) with refractory epilepsy. Patients received LEV as add-on therapy. Changes in seizure frequency and adverse events were observed. Follow-up was conducted at least 6 months after treatment. Results: In total, 46 (45.1%) of the 102 children achieved more than 50% seizure frequency reduction, and 16 (15.6%) of these were seizure free. LEV reduced seizure frequency by at least 50% in 58.3% of patients with partial seizures, in 32.0% of patients with primary generalized seizures, and in 17.6% of patients with both partial and generalized seizures. Conclusion: Our results confirm that LEV, as add-on therapy, was effective in reducing seizure frequency in a variety of seizure types but seems most effective for partial-onset seizures. LEV was also well-tolerated in children. Furthermore, LEV was well tolerated in children, leading to low discontinuation rates due to adverse events. The most common reported adverse events were behavioral changes (e.g. irritability, agitation, hyperactivity, cognitive slowing) and somnolence. All adverse events were reversible and disappeared when LEV therapy was discontinued. In the literature, several trials with LEV as add-on therapy in children and adolescents with refractory epilepsy have shown varied efficacy in both partial and generalized seizures. , We have retrospectively studied the efficacy and tolerability of add-on LEV in our children with refractory epilepsy during 6 month treatment. We reviewed our database between 2007 and 2010 and determined 102 patients with refractory epilepsy (defined as recurrent seizures that have failed to respond to trials of at least two AEDs used in combination, despite using the maximum dosage, or dosage resulting in therapeutic drug levels) who had been on LEV in combination with other AEDs for at least 6 months. We reviewed the medical records of these patients retrospectively. Data such as age, gender, age at seizure onset, seizure type, etiology, mental retardation, neurologic deficits, the period of the treatment with LEV in combination with other AEDs, the dosage of LEV, side effects, seizure outcome, neuroimaging findings, and EEG findings were recorded. Seizures were classified in accordance with the International League Against Epilepsy classification of epileptic seizures and epileptic syndromes. Levetiracetam was initially administered in a twice daily administration with a starting dose of 10-20 mg/kg per day. Further doses were titrated until patients were seizure-free. The patients were monitored clinically for at least 6 months after starting of LEV. Clinical response to the treatment was evaluated by the comparison of mean seizure frequency in the 3-6 months preceding and following LEV treatment initiation, respectively. The medication was considered as "effective" when all seizures had ceased or seizure frequency was decreased by ≥50% and "not effective" when seizure frequency was decreased by <50%, unchanged or worse. One hundred two children, mean age 96.00 ± 31.15 months (48-168 months), were included in this study. Of 102 patients, 56 (54.9%) were boys and 46 (45.1%) were girls. The mean age at the seizure onset was 36.16 ± 28.77 months (2-132 months). A total of 10 different concomitant AEDs had been prescribed. The most common concomitant AEDs in order of frequency were valproic acid, oxcarbamazepine, carbamazepine, topiramate, and lamotrigine. Five patients had received at least five different AEDs, 22 patients had four AEDs, 37 patients had three AEDs, and 38 patients had two AEDs before LEV. Most patients were developmentally delayed or mentally retarded (72.5%) and had symptomatic epilepsy (59.8%). Levetiracetam therapy was started with a twice daily oral regimen of 10 mg/kg per day and was gradually increased from 20 to 60 mg/kg per day within 4 to 6 weeks according to clinical efficacy and tolerability. The mean maintenance dose was 44.1 mg/kg/day (24-60 mg/kg). Sixty children (58.8%) had partial seizures with or without secondary generalization, 25 (24.5%) had generalized seizures, and 17 (16.7%) had both partial and generalized seizures. The diagnosis was in 13 (12.7%) children as continuous spikes and waves during slow sleep syndrome (CSWS), in 12 (11.8%) as Lennox-Gastaut syndrome (LGS), and in 4 (3.9%) as astatic myoclonic epilepsy. In 12 children (11.8%), the etiology of epilepsy was classified as idiopathic, in 61 (59.8%) as symptomatic, and in 29 (28.4%) as cryptogenic. The most common cause was hypoxic insults during the perinatal period (n= 26). 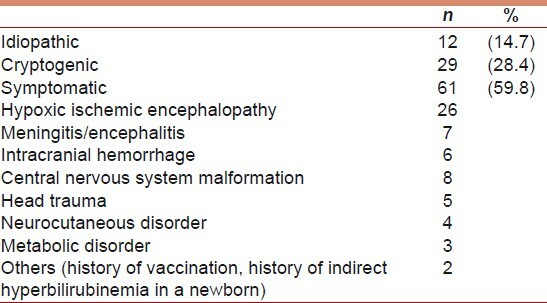 Other etiologic factors included malformations of the central nervous system, meningitis and/or encephalitis, head trauma, inborn metabolic disorders, intracranial hemorrhage, neurocutaneous disorder, and others (history of vaccination, history of indirect hyperbilirubinemia in a newborn) [Table 1]. Common associated findings were mental retardation and abnormal physical/neurological findings such as abnormal tone, hemiparesis, hemidystonia, microcephaly, neurocutaneous features, and autistic traits with or without dysmorphic features. The results of neuroimaging studies of 102 patients were available; 60 of them had abnormal findings. The mean duration of epilepsy in patients was 60.00 ± 27.86 months (range: 12-144 months). Forty-six children had a seizure reduction of more than 50% after 6 months of LEV treatment. Sixteen of these children were seizure-free. LEV reduced seizure frequency by at least 50% in 58.3% of children with partial seizures, in 32.0% of children with primary generalized seizures, and in 17.6% of children with both partial and generalized seizures. Over 50% reduction in seizure frequency was found, in 2 of 12 children with LGS, in 1 of 13 children with CSWS, and in 1 of 4 children with astatic myoclonic epilepsy. There were no statistically significant differences between responders and nonresponders for age of seizure onset, age of LEV introduction, dosage of LEV, etiology, or neurological abnormality. Efficacy of LEV was significantly associated with duration of epilepsy, seizures type, and mental retardation (P<0.005) [Table 2]. The side-effect profile of LEV observed during the treatment of the patients is shown in [Table 3]. The most common side effects included somnolence, fatigue, and dizziness. Statistical analyses were performed using SPSS 16. Independent T-test and one-way ANOVA were used to compare decreases in means of seizure frequencies between age groups, males and females, partial and generalized seizure types, types of epilepsy syndromes, neurological abnormality, mental retardation, duration of epilepsy, dosage of LEV, and between children with different EEG or imaging data. Levetiracetam was effective in both partial and generalized seizures. In the literature, it has reported efficacy as "add-on" AED for partial seizures with or without secondary generalization and generalized seizures. , The percentage of children with more than 50% reduction in seizure frequency ranged from 20% to 61% in these studies. Wheeles et al. reported more than 50% reduction in seizure frequency in 57.7% of 39 children. Mandelbaum et al. reported 59 children with intractable epilepsy. They found that 31 patients (53%) had more than 50% reduction in seizure frequency and 12 patients (20%) attained remission. Our results are similar with previous studies on the efficacy of LEV as add-on therapy in children. We found more than 50% reduction in seizure frequency in 45% of the children, and 15% of them became seizure free with LEV treatment. Levetiracetam was also effective in both localization related and generalized epilepsy syndromes. Epileptic syndromes with CSWS represent a wide spectrum of epileptic conditions associated with cognitive dysfunction that have the EEG pattern of CSWS as common feature. Recently, reports have suggested that LEV may be useful in CSWS. , Capovilla et al. reported total seizure control in two of three patients with CSWS. Lennox-Gastaut syndrome is an epileptic encephalopathy characterized by multiple seizure types, mental retardation, and a slow spike-and-wave pattern on electroencephalography. Medical intractability is common. Reyes et al. identified a case series of six patients diagnosed with LGS in which LEV was initiated as add-on therapy. At follow-up, four patients experienced 100% reduction of their myoclonic seizures; two patients had greater than 50% reduction of their atonic seizures, and four patients experienced 100% reduction in their generalized tonic-clonic seizures. They suggest that LEV appeared effective in reducing seizures in LGS. In our study, we detected seizure reduction of more than 50% only in two children with LGS, and in one of four children with astatic myoclonic epilepsy. Our retrospective study of children with refractory epilepsy, suggests that LEV may be a useful adjunctive treatment in children with this condition. In our study, seizure reduction or seizure free was noted for all seizure types, but especially in efficacy partial-onset seizures, thus supporting the utility of LEV as a broad-spectrum AED. It must be emphasized that our study population was heterogeneous in terms of seizure type, epileptic syndrome, etiology and additional neurological difficulties. It is therefore inappropriate to comment on the effectiveness of LEV for specific epileptic syndromes. In addition, all children in the current study had failed multiple AEDs before LEV in our study. Recently, several studies have established the safety of LEV in the treatment of children with epilepsy. , The incidence of side effects of LEV is approximately 30% to 45%, and exceeded 50% in one study. , Somnolence, fatigue and anorexia were the primary adverse events that mainly presented during the titration period and gradually disappeared within the first month. In our study, LEV was extremely well tolerated. Forty patients (39.2%) reported adverse events. The most common adverse events were somnolence, fatigue, and dizziness. Most events were behavioral in nature and did not require discontinuation of LEV. Our results show that LEV therapy is potent, safe, and well tolerated in children with refractory epilepsy. In conclusion, our results confirm that LEV, as add-on therapy, was effective in reducing seizure frequency in a variety of seizure types but was most effective for partial-onset seizures. 1. Grosso S, Cordelli DM, Franzoni E, Coppola G, Capovilla G, Zamponi N, et al. Efficacy and safety of levetiracetam in infants and young children with refractory epilepsy. Seizure 2007;16:345-50. 2. Coppola G, Mangano S, Tortorella G, Pelliccia A, Fels A, Romano A, et al. Levetiracetam during 1-year follow-up in children, adolescents, and young adults with refractory epilepsy. 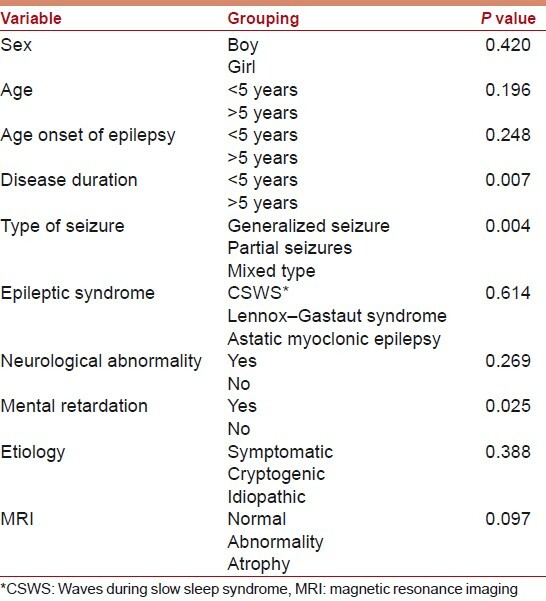 Epilepsy Res 2004;59:35-42. 3. Tonekaboni SH, Ghazavi M, Karimzadeh P, Mahvelati F, Ghofrani M. Efficacy of levetiracetam in children with refractory epilepsy as an add-on trial. Epilepsy Res 2010;90:273-7. 4. Tan MJ, Appleton RE. Efficacy and tolerability of levetiracetam in children aged 10 years and younger: a clinical experience. Seizure 2004;13:142-5. 5. Callenbach PM, Arts WF, ten Houten R, Augustijn P, Gunning WB, Peeters EA, et al. Add-on levetiracetam in children and adolescents with refractory epilepsy: results of an open-label multi-centre study. Eur J Paediatr Neurol 2008;12:321-7. 6. Peake D, Mordekar S, Gosalakkal J, Mukhtyar B, Buch S, Crane J, et al. Retention rate of levetiracetam in children with intractable epilepsy at 1 year. Seizure 2007;16:185-9. 7. Nakken KO, Eriksson AS, Lossius RASM, Johannessen SI. A paradoxical effect of levetiracetam may be seen in both children and adults with refractory epilepsy. Seizure 2003;12:42-6. 8. Wheless JW, Ng YT. Levetiracetam in refractory pediatric epilepsy. J Child Neurol 2002;17:413-5. 9. Mandelbaum DE, Bunch M, Kugler SL, Venkatasubramanian A, Wollack JB. Efficacy of levetiracetam at 12 months in children classified by seizure type, cognitive status, and previous anticonvulsant drug use. J Child Neurol 2005;20:590-4. 10. Capovilla G, Beccaria F, Cagdas S, Montagnini A, Segala R, Paganelli D. Efficacy of levetiracetam in pharmacoresistant continuous spikes and waves during slow sleep. Acta Neurol Scand 2005;110:144-7. 11. Hoppen T, Sandrieser T, Rister M. Successful treatment of pharmacoresistent continuous spike wave activity during slow sleep with levetiracetam. Eur J Pediatr 2003;162:59-61. 12. De Los Reyes EC, Sharp GB, Williams JP, Hale SE. Levetiracetam in the treatment of Lennox-Gastaut syndrome. Pediatr Neurol 2004;30:254-6. 13. Koukkari MW, Guarino EJ. Retrospective study of the use of levetiracetam in childhood seizure disorders. J Child Neurol 2004;19:944-7. 14. French J, Edrich P, Cramer JA. A systematic review of the safety profile of levetiracetam: A new antiepileptic drug. Epilepsy Res 2001;47:77-90. 15. Li S, Cao J, Xiao N, Cai F. Efficacy and safety of levetiracetam as an add-on therapy in children aged less than 4 years with refractory epilepsy. J Child Neurol 2010;25:609-13. 16. Thacker AK, Misra P, Gupta PP. Exacerbations of seizures by levetiracetam. Epilepsia 2008;49:177. Kumar Banerjee, T., Kumar Das, S.